Despite the rapidly expanding agreement among experts that children and a host of other vulnerable groups—including victims of torture, stateless people, and pregnant women, among others—should never be detained, the fact is that we live in dark times when it comes to the treatment of migrants and refugees. Which country in the world today welcomes the most vulnerable among us? It is not an easy question to answer. While some courageous public officials continue to speak out for the rights of non-citizens, the dominant political discourse in many countries is that undocumented foreigners are dangerous and must be blocked, arrested, detained and deported, regardless of the repercussions. We at the Global Detention Project are constantly reminded of this fact. Every day, there are untold thousands of people—including families and children—locked up in migration detention facilities, sometimes alongside criminal populations, often without the legal protections or due processes that are afforded criminals, simply because of their migration status. And no matter the country we are researching, the local partner we are working with, the journalist we are talking to, the UN body or national human rights institution we are addressing, or the scholars we are collaborating with, the overriding message is: things are going to get worse before they get better. For things to get better, there must be a fundamental shift in states’ responses to the movement of people, along with a monumental effort to engage populations that feel threatened by these movements. Central to this shift must be a commitment to respect the core human rights treaties, all of which provide obligations that are intended to protect citizens and non-citizens alike, including the undocumented. And yet, as negotiations by UN member states on new “Global Compacts” on migrants and refugees enter their home stretch, what we hear is that these “old instruments” will have to make room for “new instruments,” as the organisers of a recent human rights conference at the University of Geneva framed it. The GDP is committed to working to ensure that these “old instruments” remain an effective tool for holding states accountable when they decide to place a person in detention based on his or her migration status. 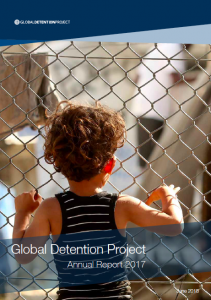 As this Annual Report makes clear, we have made important progress: we have expanded our engagements with human rights mechanisms; we have developed new collaborative agreements with a host of local partners from Europe to Asia, Africa, and the Americas; we have broadened the literature explaining and critiquing the politics and policies that are leading to more detention; and we have helped shape the global conversation on this issue. While it may be tempting to see only the negative, there are signs of change. For instance, the growing acknowledgement that the detention of children is wrong has been bolstered by a string of recent cases at the European Court of Human Rights that have narrowed the permissible scope for detaining children, emphasising their vulnerability over considerations of their immigration status. Several countries have adopted important reforms in recent years. Two notable cases: Taiwan adopted a law ending the detention of several vulnerable groups including women who are more than five weeks pregnant, and Germany—responding to a judgment by the Court of Justice of the European Union—has stopped using prisons for immigration purposes. Even in the United States, where the current administration is rapidly expanding its efforts to detain and deport undocumented residents, tearing thousands of families apart, crusading jurisdictions in states like California are refusing to end the “sanctuary” they provide to immigrants who are vulnerable to detention and deportation. The GDP was founded with the mission of exposing the practices and impacts of immigration detention to the light of day to ensure that migrants, refugees, and asylum seekers are treated with dignity and respect and that states adhere to fundamental human rights in their immigration procedures. With support from our key institutional partners—the Oak Foundation, the Open Society Foundation, and the Human Security Division of the Swiss Federal Department of Foreign Affairs—we continue to pursue this goal. We look forward to working with all of our partners in the coming year to continue this increasingly important work.